Yoga is not at all about materialism, gadgets and accessories. Still, as a fairly recent newbie, I was quite at a loss what to bring with me to my Bikram Yoga class. Although not about the materials, having good gear makes it easier to focus on the poses. So, check out the promising results of the yoga hardware research I performed. At 6′ 5″ ft (196 cm), I found out that for starters, my mat is a little too short. Especially for some intense poses that require complete length stretching of the body, things can get pretty uncomfortable without a mat beneath the feet. Also, I wanted to make sure I had some reliable shorts to wear. I decided to scour the internet hoping to find the answers. Here are some of my findings. 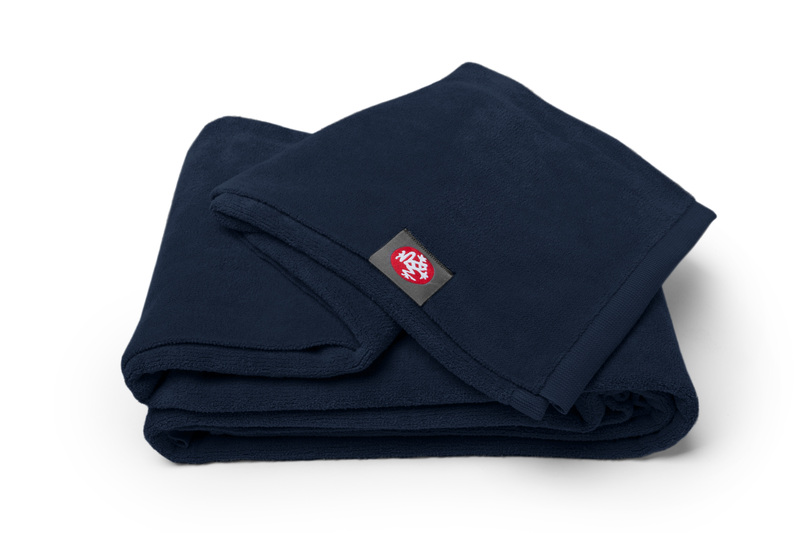 The towel (I got a dark grey one) is very soft and looks pretty as well. I have washed it a couple of times and the quality has not decreased: it stays soft and it does not wrinkle or lose color. Also, the towel rolls up into a very small bundle, which makes it fit into my bag easily. Great product, all in all I would give it 8,5 out of 10. A second Maduka towel, this time not extra long, but the Hot Yoga version. Special-made for Hot (or Bikram) Yoga, this towel should turn out a great fit for my needs. I got a deep dark blue one, very nice color. This towel is even softer than the first one, mainly because it’s thicker. The extra thickness allows for 50% more absorption of sweat, which comes in very handy in Bikram class…As it turned out, I love this towel! I can’t wait for it to come out of the dryer so I can throw it in my bag and ride off to class. The towel, like the first one, stays in great shape after washing and drying. It covers my complete mat, no extra overlapping like the first one, but that’s the only downside to it. Most people don’t have the length issue, so I guess it makes sense they don’t come in extra long. All in all, the Hot Yoga Manduka scores a 9 out of 10. Fitting, flexibility and quality convinces also the most demanding customers. Our yoga pants are born from regular yoga practise and had been designed by a yogateacher together with a ladies tailor. This is not only obvious while testing the fitting, but also in asanas like lotus, butterfly, downward dog and other poses, which are challenging the capabilities of a yoga pant. At yoga pants it is important, that they are very flexible in the area of knee and crotch. Also the waistband must be super soft, but not slipping downwards. Here we are using extra soft rubber band, but also cords, which are placed either in or outside the waistband. For comfort we from ZAMKARA are using most often a high-quality materialmix from organic cotton and a small portion of elasthan. Each item is wellthought, it is possible to combine most of the articles and they are so comfortable, that you don’t want to change them after the lessons. While fitting you should do some simple stretching, bending or twisting exercises – you will feel immediately, what a good yoga pant is like. This proved to be quite true. The shorts look and feel very simple, basic and humble, yet reliable and durable. Just what you want from good yoga shorts. And, I must say, having washed them a number of times, they stay in good shape too. All in all, I would grade the Bihar shorts a solid 8,5 out of 10. I’m almost embarrassed to admit this, but, yes, yoga works. For me, at least. So what if I am a little late to the party, at least I’m there, aren’t I? I have finally woken up. Apparently, this is what my life’s been lacking. Ok, I did some meditating back in high school and in my first year in college in PA. But that’s long long ago. I now know that a busy lifestyle really benefits from some regular variety in what occupies the mind. Stepping out of the rat-race every now and then, focusing on other things than work, chores and helping others. Focusing on nothing or just the physical. Now mind you, this is nothing new. Many people get this benefit from doing sports. I do too. I work out 2 or 3 times a week, but it’s not the same. I needed something else, on the side. I discovered Bikram Yoga and have liked it ever since I started practicing it. Every sport or yoga type has its flaws, and I am not claiming Bikram Yoga is perfect nor do I blindly follow Bikram’s doctrine, but I tend to focus on the upside of things. And with Bikram Yoga, the glass is certainly more than half ful for me. If you don’t know what Bikram Yoga (aka Hot Yoga) is, click here (wiki) to find out more. What I like about it, particularly, is the fact that – due to the heat and toughness of the poses – the workout demands your utmost concentration. That way, I am forced to focus on other things than everything that harps on my mind in my daily life. It revitalizes my body as well as my mind. What more to ask for? Once I leave the torture chamber, I feel reborn. You know the feeling when you arrive on your vacation destination after a long a tiring journey? That feeling! I did, however want to work on the towel thing, though. My old IKEA-towels did the job, but they never felt right. Little rough, way too broad for my mat, slippery when wet and, honestly, not too pretty. This is where the Breathe mat came in. What can I say? Check out the picture yourself, it’s right here on the side. 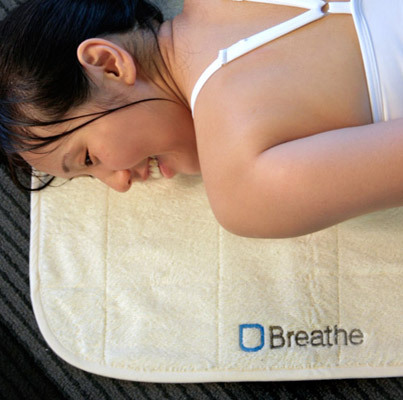 The Breathe mat is comprised of three layers: a cotton terry top, middle absorbent cushioning fibers and a coated, brushed bottom that grips carpet and rubber floors. Together, these layers comprise an anti-slip, waterproof yoga mat that fully eliminates the need for a bulky sticky mat and slippery towel. 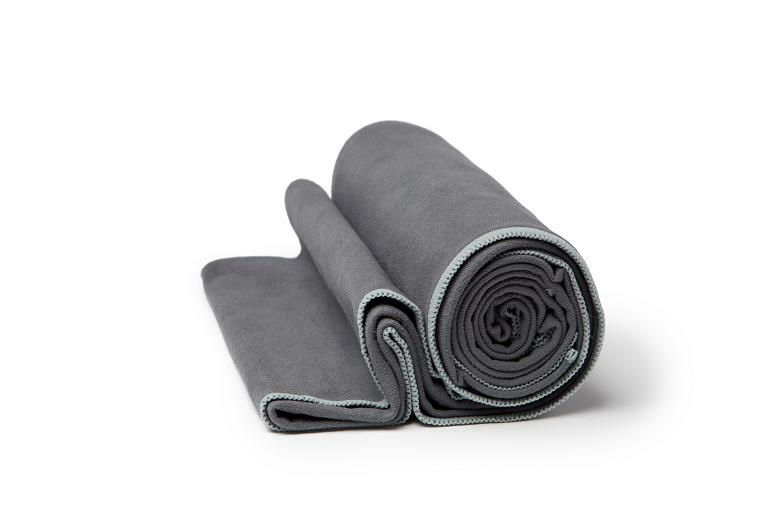 Long and thick enough to provide a comfortable, sanitary layer of protection between the body and floor of the yoga studio, yet compact enough to fold or roll up, take home from class and toss in the washer/dryer with ease. Always nice to have the hardware in order, so I can do my best to focus on the most important, my inner and outer self. You can find out everything there is to know about the Breathe mats right here. Next up: what to wear to Bikram Yoga when you don’t want to wear a Speedo. My Speedo is ok, I like the fact that it is supposed to be durable and withstands many wash cycles. But it’s not supercomfi. And that’s what I DO want when trying to focus on other things. So I discovered the Onzie. Very good stuff! Just what I like and need. Classic and comfortable men’s shorts with fully-lined and fitted pouch providing support and comfort. Stretchable elastic at waistline. Just that extra bit of length compared with the Speedo (length falls at the mid thigh). And fabric feels nice and soft but strong and durable (100% Free-Flow Fabric. 80% nylon / 20% spandex). Good choice! Very modest in look and color, perfect for the modesty and humbleness Bikram Yoga should be all about (for me). More info about the Onzie – right here! Glad to share my findings with you, hope it helped.